The cop couldn’t have been any nicer. If I had a nickel for every time he called me “Sir,” I could have paid off the $237 ticket he gave me and had enough left over to buy a frothy coffee drink. Not a good way to start the day. I had run a stop sign at Chino and Micheltorena streets on the Westside on my way to work. I’d looked both ways. It appeared safe. So I went. Obviously I miscalculated. How could I have missed a motorcycle cop? For the record, I’m not one of those cyclists. I’m happy to share the road with automobiles. I don’t cuss cars out ​— ​in French ​— ​merely for existing. I ride single file. I don’t wear spandex, and I don’t loudly click-clack down the aisles of Trader Joe’s in bicycle cleats. I am, however, a confirmed career scofflaw when it comes to stop signs. If I got caught more, I’d be a recidivist. It’s not that I’m above it all; it’s that my way’s just safer. The great state of Idaho tumbled onto this fact back in 1982, when it changed traffic codes to allow cyclists to breeze through stop signs if there was no traffic at the intersection to be yielded to. Lest this be construed as some aberrant legislative brain fart from a state better known for its white supremacists, Idaho doubled down in 2006, passing a law allowing cyclists to stop and then go at red lights. Two recent studies indicate this approach is markedly safer, counterintuitively as it may seem, for cyclists. One study reportedly shows a 14 percent reduction in collisions. A couple of years ago, the state of Delaware passed a similar law. So too have several cities in Colorado; so too has Paris. San Francisco almost did but former mayor Ed Lee vetoed it, arguing that it sent mixed messages. But here in Santa Barbara, I’ve become a not-so-innocent victim of yet another targeted safety operation brought to us courtesy of a targeted enforcement grant paid for by the state’s Office of Traffic Safety. 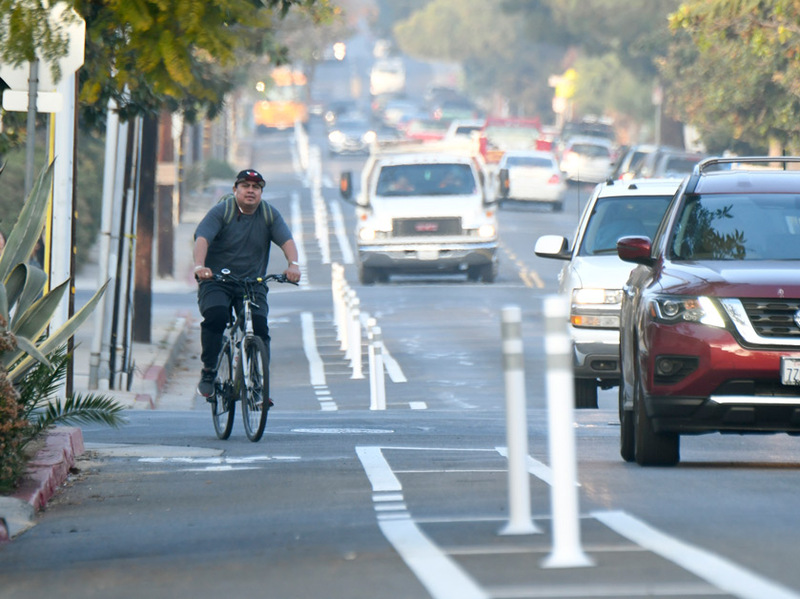 No doubt the grant application was larded with all the usual hyperventilated statistics showing that the City of Santa Barbara is one of the most dangerous cities in the state ​— ​for cities our size ​— ​when it comes to bike collisions. Like most statistics, this manages to be both true and false. Yes, we have around 100 collisions a year, and that’s a lot. But when you consider we also have way more bicycle commuters than most cities our size ​— ​we rank fourth in the state ​— ​then the numbers are not as frightening. Professional bike advocates tell me that cops use these safety grants to aggressively patrol areas where they can get the most tickets, but not where most bicycle-involved collisions actually occur. Naturally, I was shocked and appalled. This week, I was heartened to see the City Council unanimously voted to apply for $5.3 million in state alternative-transportation grants to address the city’s Number-One Hot Spot for bicycle and pedestrian collisions. According to city traffic reports, the intersection of State and Gutierrez streets is by far the most dangerous place in town for cyclists. But according to Dr. Daniel Fishbein ​— ​bicycle advocate, epidemiologist, and outspoken contrarian ​— ​the real danger zone is the freeway underpass connecting lower State Street with downtown. There have been 13 collisions there in the past 14 years. If approved, this grant would do a couple of things: It would nearly double the width of the existing sidewalks so that people walking past each other will no longer encroach awkwardly into each other’s personal-bubble space. The road width allotted for bike lanes would double as well, with buffer zones thrown in for added protection. This would be accomplished by reducing one of the four lanes Caltrans insisted back in the ’90s be included for cars. As predicted by the naysayers way back then, the traffic volumes needed to justify those four lanes never materialized, so this lane-ectomy should not impinge upon the forward mobility of any of our four-wheeled friends. Throw in better lighting, lose some of the effervescently aromatic eau d’urine, and the underpass could be transformed from a place where trolls hang out to a happening space. Add some artwork ​— ​now on the drawing board ​— ​and its razzle could dazzle. Given that Amtrak will start delivering a genuine commuter rail service for the first time in the history of the world early next month, this part of town should be experiencing a significant bump in new foot traffic. How much this improves safety for cyclists, however, has yet to be seen. According to Fishbein, the contrarian epidemiologist, many of the bike accidents in the underpass do not involve cars at all. The one recorded fatality, he said, involved two bikes at night in the dark. Many involve cyclists riding under the influence. The real issue, he said, is speed. The sharp downhill gradient leading to both ends of the underpass “tunnel” allow cyclists to gather steam. Speed kills. If City Hall really wanted to reduce the carnage of collisions, Fishbein suggested, it should reduce speed limits throughout the entire city to 20 miles per hour. That’s what the city of Edinburgh, Scotland, did, and it achieved remarkable results. For the City of Santa Barbara, however, the Edinburgh model ​— ​and the Idaho stop ​— ​are still too radical to even contemplate.